Using a proper matting system can have enormous benefits to your facility. 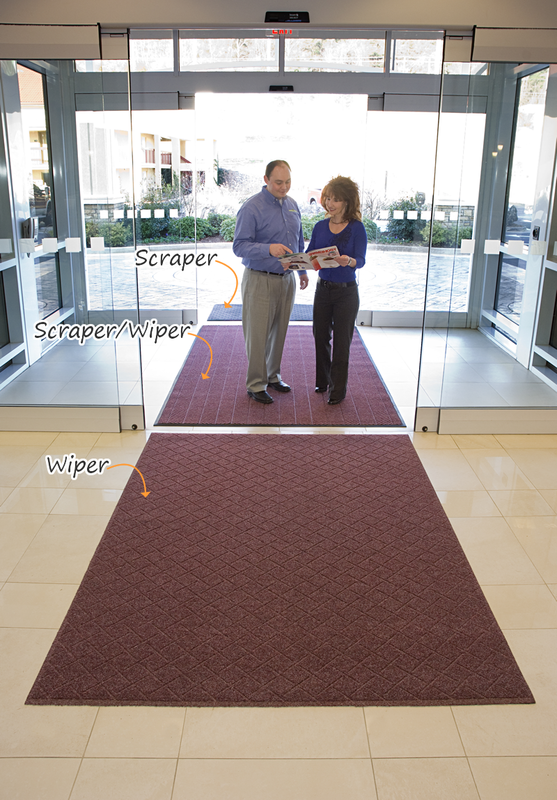 With 3 mats at your entrance you stop dirt at the door - keeping your facility entrance clean while saving your company time and money. • The first line of defense is the scraper mat. This mat is featured outside your entrance and is made of rubber or a durable fabric. The scraper material can withstand constant exposure to weathering and outdoor elements. • The second mat is the scraper/wiper mat. This mat features a tough, fabric top equipped with grooves or nubs on the surface. The nubs scrape the dirt while the fabric top wipes away moisture. • The third, and final, mat is the wiper mat. A long runner with a absorbent fabric top traps all the remaining moisture and residual dirt leftover. This mat completely dries your visitors feet by the time they make it into your facility - no more wet footprints tracked along your floor. 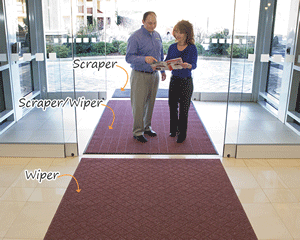 • Use the 3 mat entrance system to promote your company brand with our logo matting options. 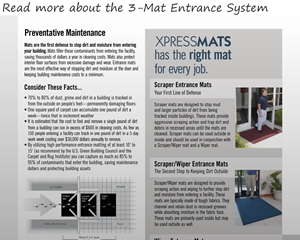 • Take a look at our 3-Mat Entrance Guide to see all the benefits the system can provide!